Thank you! Please check your email in a few minutes for your downloads to arrive. Are you ready to take your yoga practice to the next level? Dive deep into the parts of yoga that you only briefly hear about in class and discover the life-changing capacity of this 5,000+ year old tradition. SoulPlay Yoga’s 200 Hour Vinyasa Teacher Training is designed to immerse you into all aspects of yoga. You'll gain a solid understanding of yoga’s origins and how it has evolved into the modern practice we see in studios today, and you'll acquire the tools, language, knowledge and skills to apply this transformative practice to every area of your life and to teach it wherever you go. Teacher Training is NOT only for people who want to teach yoga! It is for people who have been touched by their yoga practice and who want to explore its deeper teachings. Yoga is about finding peace within oneself - whether you want to help others find it or want to build lifelong tools to help yourself, this 4-month journey will invite you to look at your life honestly and propel you towards a deeper understanding of how you move through the world and how you can do so with more joy, compassion and purpose. This is not a cookie-cutter program where you learn to teach a set sequence. This is a program that develops YOU, your passions, your strengths and your interests and that teaches you how to incorporate those into poignant, intelligent yoga classes. Are you passionate about the physical practice, designing fun sequences and taking people on a movement journey? Are you excited about breath work, meditation and controlling energy in the body? Are you a science nerd fascinated with integrated anatomy and how yoga helps strengthen and support the body? Are you passionate about inspiring, motivating and helping people realize they are more in control of their lives than they think? Whatever your passion is (maybe you're not sure yet! ), you'll develop it and learn to share it. Beyond being a well-rounded and comprehensive foundation for teaching and practicing yoga, this training will guide and support you in your journey of Svadhyaya: self-study. The most powerful part of teacher training is the personal transformation that naturally occurs as you bravely find your authentic voice and learn to trust and embody what you love about yoga. The SoulPlay Team holds a fiercely compassionate, safe and fun space for you to grow and teach, and the combined backgrounds of the teaching team makes for an intimate and truly individualized experience. Beyond developing your personal practice, our goal is for you to come out of this training fully ready to sequence and teach a 60, 75 and 90 minute Vinyasa class for all levels, offering appropriate modifications for beginners or more seasoned students. Many of our trainees get hired at studios around town very soon after completing their training and it's one of the things we are most proud of! Get out there and share the peace! Requirements for registration: At least 1 year of a consistent yoga practice. $650 non-refundable deposit holds your spot. Balance due by the first day of training. Payment plans available (typically $575 per month for 4 months). With a background in fitness and bodybuilding training, Nathania stumbled into yoga by accident in 2009. It started as a purely physical endeavor and quickly became a much deeper journey towards personal healing and transformation. Yoga gave Nathania permission and the courage to take ownership of her circumstances which resulted in a complete life change. Through a dedicated yoga practice and pursuing her Master’s degree in Psychology, Nat unearthed a passion for helping others (but really, herself) transform their lives, free themselves from restrictive behavior patterns and dare to be unapologetically real. She believes that yoga, movement and a connected body and mind create a powerful gateway to self-love and personal growth. 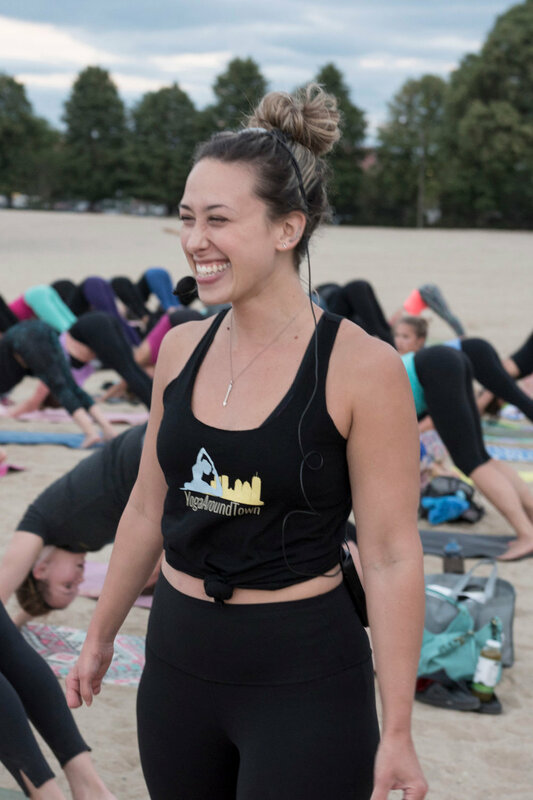 Nathania’s is passionate about helping students explore and believe in their own potential with mindful, functional, creative and playful yoga classes that break out of the traditional yoga mold. Incorporating a strength-based approach and movement patterns from other modalities, she encourages you develop ownership over how YOUR body moves best. She believes in showing you how your time on your mat can be a catalyst for both personal change and acceptance. Nathania (E-RYT 200) earned her 200 hour certification in 2015 with Cheryl Moss and Kate Duyn at GODA Yoga. She has since completed over 500 hours of advanced trainings with Laughing Lotus, Annie Carpenter and Noah Mazé, taught over 4,000 class hours and co-led four SoulPlay Yoga Teacher Trainings with Cheryl Moss and Claudia Fucigna. Nathania owns & operates SoulPlay Yoga and leads yoga, fitness & adventure retreats throughout the world with SoulTribe Adventures which she co-founded in 2017. Originally from Indiana where I fell into yoga at age 12, I moved to Chicago in 2003 as a classroom teacher with Teach For America. As I folded more movement practices into my teaching in museums and off-site programs, I became a personal trainer in 2007 through the American College of Sports Medicine. In 2010, I did my first of two trainings with Corepower Yoga, becoming a Sculpt instructor first, and a Hot Power Fusion instructor within the following few months. I moved to Boston shortly thereafter, where I continued my yoga learnings with Back Bay Yoga and their Hip Hop Vinyasa training. Craving a variety of perspectives, in 2016 I did an intensive 200-hr training with Yogaworks in Santa Monica over the course of four weeks. It was, along with a need for sun and adventures, what ultimately convinced me to make the move out West a year later. I am overjoyed to call this place my home. "The Soul Play instructors Nathania and Cheryl, have been my teachers for about 5 years. With this, I knew that Soul Play had to be the studio I took my training with. The curriculum, guest instructors and teaching methods were above and beyond, setting it apart from other trainings. I would and will definitely recommend this teacher training to my friends and peers." "Nathania has created a well-rounded and rigorous training program that has prepared me to not just teach yoga, but to teach yoga in a way that respects, honors, and draws from the vast resources, history, and philosophies of yoga. Not simply a program focused on how to teach asanas, the program invites its students to dive within themselves, to confront, honor and grow from their own personal struggles. All of this is done in a context of following the 8 limbs of yoga and applying this way of living to how you show up as a teacher. The supportive, non judgemental, and encouraging environment created by SoulPlay adds to the ability for each trainee to be vulnerable and honest, bringing out their best, truest self, and helping trainees to find their voice as a teacher." "My teacher training experience at SoulPay Yoga helped empower me to transform myself. It also helped me find my voice to invite others along on the journey. The classes and teachers are passionate and enlivening. The community is very welcoming and the atmosphere definitely fits the name, this is perfect place to let your Soul Play." "My 200-hour training at SoulPlay Yoga was an amazing journey. I came out of training completely prepared to teach public classes. I am very pleased with my results and glad I chose to train at SoulPlay Yoga." "The 200-Hour Yoga Teacher Training program was more than I could have imagined, and everything that I needed in my life. I’m still blown away about the amount of information that I learned and that I retained by the time we approached the final weekend. I remember the 1st day that I showed up and looked at the book list and the large 300-page training manual and thought, “Wow this is more than I bargained for.” As a fitness professional, I’ve done 5 other format training, and yoga is definitely the most intensive, and rightfully so. What I most appreciate about SoulPlay Yoga’s training is that it’s authentic and culturally relevant. This isn’t a watered down or culturally-appropriated training for the average person to digest; it is a deep and thorough dive into the history of yoga, the scholars, philosophies, theories, people, language, and culture. SoulPlay’s training makes you want to go to India and practice and study more. I love that they kept us deep in the tradition and philosophy. In addition, we received thorough training in the asana practices—with special and consistent attention to anatomical detail. Furthermore, knowledge of Sanskrit was a staple of this training program. Our trainers Cheryl Moss, Claudia Fucigna, and Nathania Stambouli were incredibly wise and knowledgeable. I feel like I was, absolutely, trained by mystical and physical goddesses. I also work full-time, and didn’t know how I was going to balance my time between the readings (OmWork), practice hours, observations, essays and assorted projects. But through the yoga, I learned and even greater sense of spiritual discipline (tapahs), self study (svadhyaya) and found the desire and passion to continue on week-after-week. Completing yoga teacher training is in the top 10 best things that have ever happened in my life. Last, but certainly, not least, the friendships and bonds that SoulPlay’s program, helped to create and foster, are among the most important treasures that I took away. I have a close connection with each one of my fellow trainees and our instructors, and will likely know them all for the rest of my walking days on this Earth. SoulPlay’s yoga training program is a part of my life’s story and journey, and my spiritual home for the rest of my life. I couldn’t recommend this teacher training more, as I have more clearly been set on the path to discover my truth (satya) that will ultimately guide me into new pathways." "The teachers were fantastic - they took the time to make sure we understood yoga from a holistic perspective including history, sacred scriptures, asana, anatomy, yoga for injuries, prenatal, yoga for kids, pranayama and much more. I felt in very good hands. They are wise, patient, thorough teachers who care about the craft of yoga. It is clear through the energy they bring in the classroom that they love what they do, which in turn energizes the students to engage in the learning. That we get to collectively teach a class to the public was a fantastic finish to the program. I highly recommend this training program to anyone interested in teaching, or just looking to deepen one's personal practice. The training addresses yoga from so many levels- anatomical, energetic, emotional, mental, spiritual. The end result is a comprehensive, powerful yoga teacher training experience that leaves me well prepared to take on the next step in my teaching journey." "SoulPlay Yoga's 200 Hour Teacher Training was incredibly comprehensive and well-rounded. From broken-down study of each posture and how to best cue and teach it, to mantras, mudras, chanting, philosophy, anatomy, different styles of yoga and healing modalities, I felt that I came out of the training with a very robust understanding of how to help people through the practice of yoga in a myriad different ways. The principal trainers complement each other amazingly well and offer so much of themselves and their experience to us as students, enriching the classroom experience that much more. They are also committed to helping their students excel and teach as soon as the training is over - as students we feel incredibly supported, which is hugely important. I definitely recommend this training and would do it all over again in a heartbeat! If SoulPlay ever offers a 300 hour training, I will enroll! THANK YOU for the training and experience of a lifetime!!" "The time I spent in the SoulPlay Yoga Teacher Training program was nothing less than magical. My life has been changed forever! Not only were the teachers knowledgeable and passionate, but they shared wholeheartedly with their students from day one. It was evident that their intention was to lead and mentor a group of yogis to become well-rounded, capable, and as passionate as they are about Yoga - all 8 limbs. I highly recommend this teacher training program to anyone who is interested in learning the history and philosophy of Yoga as well as expanding their understanding of the asanas, proper alignment, adjustment, and sequencing techniques. This training went deep...I feel very prepared to enter the world as a teacher and I understand the responsibility of the gift I've been granted to share." "This was my second 200 hour teacher training, and it absolutely exceeded my expectations. They were extremely thorough. They gave us a sampling of many different schools of yoga, while maintaining a cohesive style of instruction themselves, and allowing the trainees an opportunity to decide what aspects they want to bring from each school into their own teaching. There was a lot of thought, time and creativity brought to this training, and a lot of exposure to guest teachers, sound, meditation, anatomy, as well as guidance around ethics and the "business" of yoga. I hope they will expand the business of yoga section and keep that segment open to other teachers outside of the training." Questions about our Teacher Training? Fill out the form below and we'll get in touch with you by email (or by phone if you prefer) to answer all your questions. Feel free to ask any questions in the Message box, or give us your phone number so we can chat and see if our training is the right fit for you!